For newer Pew Research Center findings on fathers, click here. The Census Bureau estimates that last year there were about 189,000 stay-at-home dads, defined as married fathers with children younger than 15 who stayed out of the labor force for at least one year primarily to care for the family while their wife works outside the home. Those dads cared for an estimated 369,000 children. Fathers have nearly tripled the amount of time they spend with their children, from 2.5 hours in 1965 to 7.3 hours per week in 2011, according to a Pew Research report that analyzed years of time-use data. Despite that increase, 46% of fathers said they spent too little time with their children, compared with 23% of mothers who said the same; half of dads said they spent the right amount of time. In 2009 there were about 2.4 million custodial fathers (that is, raising their children while the mother was living elsewhere), versus 11.2 million custodial mothers, according to a Census Bureau report. About 619,000 custodial fathers were due child support; collectively, they received about $1.9 billion. More than three-quarters of new fathers took one week or less off from work after the birth or adoption of their most recent child, according to a 2011 Boston College study of fathers at four large companies; 16% didn’t take any time off at all. 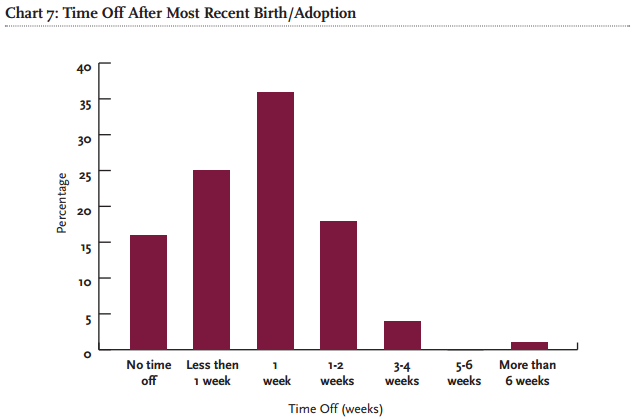 Most new mothers at the same companies took anywhere from six to 12 weeks off. Of those who took time off, 92% of fathers said they had a positive experience being with their child during that time. Forget the ties, “World’s Best Dad” T-shirts and other clothing clichés: According to a 2012 poll from market-research firm Ipsos, most dads would prefer to either spend quality time with their families on Father’s Day (40%) or receive no gift at all (22%). Gift cards were a distant third, at 13%.